Rated 5 out of 5 by bbwyldflowers from Challenging, fast paced, match 3. LOVE IT! I couldn't stop playing even when I had unlocked everything. Just kept going....just for fun! Rated 5 out of 5 by hallsdij from Excellent Game I love the the levels I can play fun and easy at first and gets more exciting as I play. I can change Villages and build as I like. I also like the last Village and its mystery. Rated 5 out of 5 by Borkzorkorc from Fun challenge with some incidental learning too I played, loved and eventually beat this on the webOS version of this app, which was the same as this. Happily, the 150 levels can still be enjoyed after completion: the 8 different "Heroes" have different strengths/weaknesses, so varying them can create additional challenges once level 150 loops back to 50 and cycles thru. The building-village was a refreshing change from war/conquest-based plots. And as a big fan of Finnish metal and music, I enjoyed learning some Kalevala lore as a bonus. Quality graphics, nice music, plenty addicting and >800 levels if accounting for switching heroes = brilliant! Rated 5 out of 5 by myyorkies1994 from I Love This Game! The crow is your nemesis! 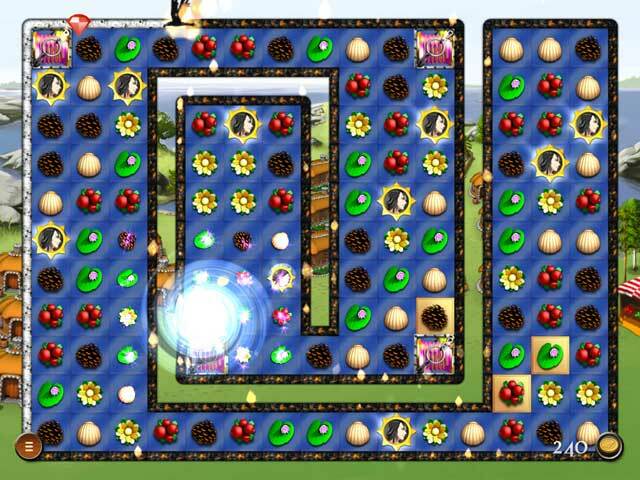 While making matches, the crow flies around the outside edge of the game board and 'claims' your gems! If he makes it all the way around, you lose a life! But, fear not, as there are many Heroes with great superpowers who help you along the way to clear the board. With the gems you earn, you help to build the village and buy items to keep you villagers happy! 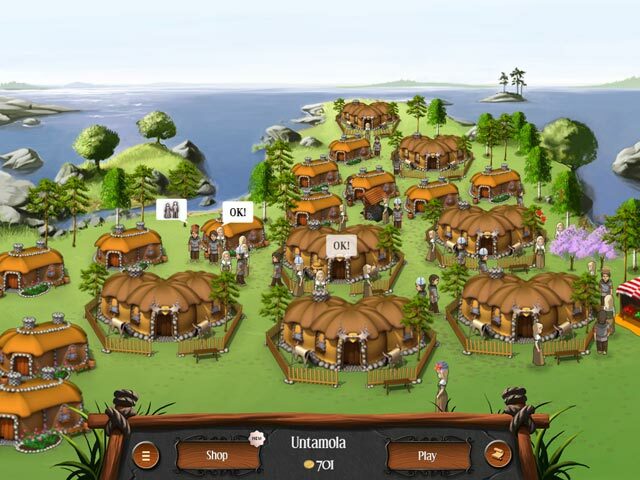 As you village becomes more complete, you earn coins toward moving to a new location and starting a new village. Great fun...but watch that crow! Rated 5 out of 5 by rogschumac from Favorite Game I play it over and over, never get tired of the challenge. Currently at 650K + for each level, so I play it a LOT! Rated 5 out of 5 by sereneorchid from Lots of interesting things going on Top marks to the designers for trying to add originality to the standard match 3 format. The iced tiles drip water like melting ice cubes. The matching icons are sharp, brilliantly colored, and have fun animations, like the oyster flipping open its shell to reveal a pearl. The timer, (which really isn't a problem), is represented by a crow flying around the puzzle and leaving a trail of fire. 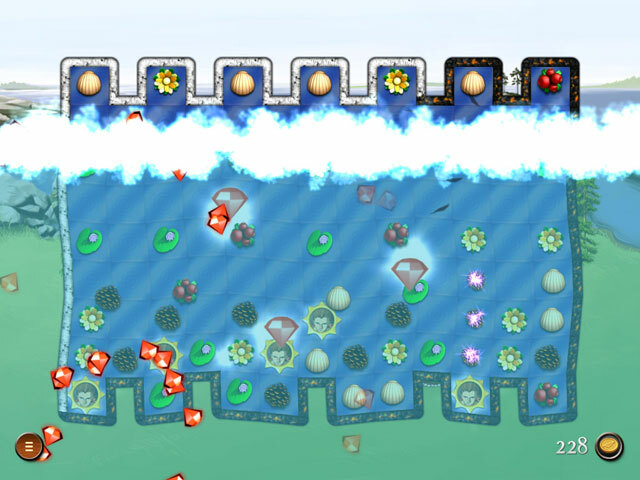 The power-ups are interesting and based upon superpowers of heroes, such as a hammer thrown by the game that smashes multiple tiles, or a flood of water by an ocean god that washes away tiles. But you only get one superhero per level, so you've got to decide which one will help the most based upon the layout of the tiles and the blocks, like chains. Creating the village didn't seem to be a big thing. It goes slowly, but the graphics and animations are nice. I'm not a city-builder type of player, so it's nice that you can come back to the game now and again without feeling you have to play through to the end. I'd give it a try. Oh wait, I already did! Rated 5 out of 5 by ecblisa from One of my favorite games to play again I thought I'd submit this review after playing this entire long game again -- actually, twice -- long after I first bought it. I want to start out by saying I hate timed games, and this game is semi-timed, in the sense that there is a timer, but there are oppotunities to stop it that do not otherwise interfere with game play. To be precise, you can stop the forward movement of the crow by making matches or blowing up bombs near it. (This is a part of the tutorial.) The thing that makes me love this game that I really should not like is the choice of "gods" to help with finishing each level. Some levels are very hard, but instead of trying the same thing over and over, you can change the helping "god" and the level will feel different on replay. And here is one non-spoiler secret from a long-time player of this game: you get better as you keep replaying it, so the frustration factor relating to the difficult levels goes down the more you play. Finally, building the four villages is so much fun on its own that it gives lots of additional value to the game It's not just the rote using up of credits because that's what's expected. Each time I've played the game I've enjoyed building better and prettier villages and watching happy villagers. To me, at least, this game has endless replay value. Rated 5 out of 5 by caracasia from great replay value This is the best match three game I've tried. 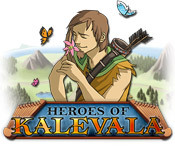 You help the People of Kalevala to rebuild 4 cities, using different gods to help you. The music is great, and it's fun to build the cities, with the improvement you earn in the match 3 levels. Rated 5 out of 5 by themare from Fun, relaxing game I got a little tired of HOGs so I decided to try a match 3 puzzle. This is a great game. This game is based on a Finnish (?) folklore. In addition to matching 3 to beat a witches raven, you also build little villages with your winnings. You also earn Finnish gods to help you beat the raven. The music is beautiful, the game gets harder, your villages grow, and you have a fun time. Highly recommended! Rated 5 out of 5 by chrisdr from top connect 3 game After reading the reviews i decided to buy this game as one comment was good and the other was bad so i downloaded the game to see for myself and it has to be one of the best connect 3 games i have bought. the levels were not hard to do as long as you used the right helper to help you get through the level. the story was excellent so thumbs from me and a must buy if you like that type of game.I would have liked it to go on and on as it was very adictive.